Businesses can use Lead Liaison’s GoExhibit!™ in many ways – it’s not just for trade shows! GoExhibit!™ is an event lead management solution, powered by a slick mobile app, aptly named GoCapture!™. If you’re using an event lead management solution like ours, this article will help you explore the other ways you can use the system and/or mobile app to capture leads. We’ve rounded up seven creative uses for event lead capture using our system. Let’s say you are a salesperson running into a meeting with a client at their office. In the elevator on the way up to your appointment, you meet someone that might benefit from your service or solution. You grab their business card and hope to A) not lose it, and B) remember to enter the information into your CRM later. Or, you could open GoCapture!™ on your mobile device, quickly take a picture of the business card, have it automatically transcribed, and sync it with your CRM. Problem solved! Does your company host, or attend, corporate events or conferences? Use the power of GoExhibit!™ to collect lead information in a streamlined, unobtrusive way. The system also includes options to create your own custom badges with QR codes. A customized registration and check-in portal can be used at the front door to help manage attendance. Exhibiting at an industry trade show? Forget those antiquated badge scanners and opt for end-to-end event lead management. Use GoExhibit!™ to announce your attendance at the event via marketing emails, social media, and more. Go a step further and use complementary marketing services that integrate with GoExhibit!™ to book demos/meetings at the trade show. Then, have your team use the GoCapture!™ app at the trade show to collect lead information via badge scan, business card transcription, attendee list search, or manual form fill. Speaking of trade shows, another way to encourage excitement with potential prospects about your service or solution is to set up individual kiosks at your booth that allows visitors to fill out their information if they are interested. Instead of a table, a sign, and a person – create an experience at your booth. Your experience should engage the prospect in some way. Consider these 20 examples of experiential marketing to get your creative juices flowing. Be smart about setting up the experience though. When people engage, capture their information. GoCapture!™ can be configured to display custom content, such as videos, text, maps, and more to perfectly pair with your experiential display. Consider setting up your booth with individual solution areas. Each area could showcase specific solutions. Have each solution on display with a tablet sitting next to it. The tablet could run a purpose-built lead capture form that has an explainer video embedded into it. This approach helps you tailor the experience to specific solutions and results in higher lead conversion rates. One aspect of GoExhibit!™ is lead qualification. Lead Liaison uses a system of scoring and grading to qualify leads. Have your sales team use GoCapture!™ as the primary method to get new leads into your system. Set up automated processes around each new lead that qualifies them. For example, give all CMOs captured with GoCapture!™ a grade increase from C (default you might set) to B. And, if the person is located in the USA then increase their grade another level, to A. On the backend, administrators can filter out ideal buyers captured anywhere, anytime, by your sales force using GoCapture!™. If you host your own marketing events, then using GoExhibit!™ should be a no-brainer. With the ability to create custom badges ahead of time or on the fly, sign people in at the front desk, or register new attendees, your team can streamline the check-in process across all of your events. Leads are readily available after the event, in GoExhibit!™, for export or further processing. Statistics on attendance and return on investment (ROI) for your event is visible in the GoExhibit!™ dashboard. To learn more about GoExhibit!™, request a free, customized demonstration here. Does your company do marketing events, like trade shows or conferences? Whether you’re just dipping your toe into marketing events, or you’re a seasoned pro, it doesn’t hurt to learn more about how to perfect your event strategy. When preparing for an event, there are two main focuses: getting your “gear” ready for the show, and setting up a process for managing the leads you get from that marketing event. 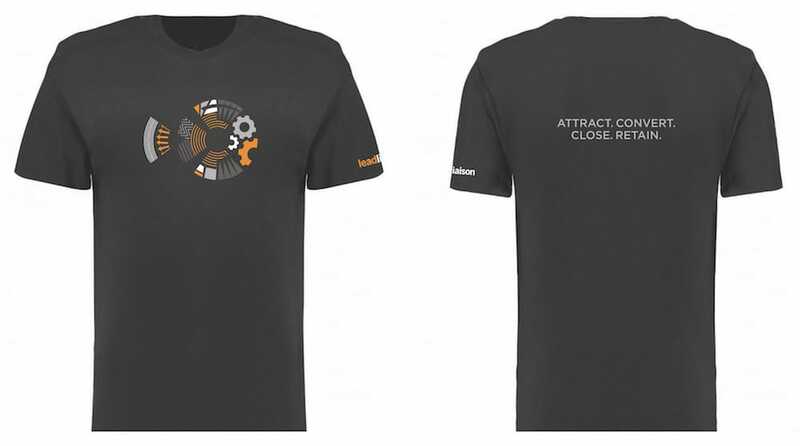 We’ll save the “gear” topic for another day…today we’re thinking about LEADS! What do marketing and sales always have in common? The answer: leads (duh). Marketing teams generate leads, and sales teams pursue them. Marketing events, and the like (conferences, trade shows, etc.) are incredibly effective ways to generate leads. But there’s often a lot of prep work that goes into these events. Find an event lead management strategy that works best for your business. Do you prefer to just order a lead scanner and do the rest manually? Or, do you prefer to use a lead capture app that already integrates with the rest of your marketing and sales technology (ex: marketing automation platform and CRM)? We prefer to use our lead capture app, GoCapture!™, as it integrates seamlessly with our marketing automation platform and our CRM. We can easily connect the dots between our event-specific marketing campaigns and the end results. We can also customize our forms so that we capture all of the information that we want/need, and we have limitless options for lead capture (not just badge scanning!). Meet with your team (marketing AND sales) and lay out a plan for how you wish to follow up with your leads. A quick text saying, “Thanks for stopping by our booth!” goes a long way – especially considering the amount of email follow-ups those folks will probably have the next morning. Are there any special offers or messages that you should incorporate into your follow-up? Get to the drawing board (quite literally, if you have to!) and map out how you will nurture those leads (your “nurture campaign”). Part of a thorough event strategy is making sure that everyone is on board and knows what kind of messaging that lead will receive. Determine the proper lead score for this event and incorporate that into your post-event lead nurture plan. Either manually, or automatically if you’ve got the technology, add that number to Prospects’ overall scores. Ensure proper lead distribution. Many marketing automation platforms will allow you to automate your lead distribution based on specific rules, or round-robin. Make sure everyone is on the same page about how those leads will be distributed so there is no confusion later. Incorporate omnichannel marketing in your nurture campaign. Sure, emails are great – of course those should be included. But text are powerful, postcards are unique, and handwritten letters give a personal touch. Set up your post-event nurture in your marketing automation platform prior to your event, so that once that lead is captured, it is automatically tagged, segmented, scored, and placed into an automation. Keep in mind that you can usually clone your nurtures (aka automations). Put the proper legwork into creating a killer nurture campaign, and then rest easy knowing you just have to edit a few minor things (like event name, etc.) next time around. Okay, now back to your event strategy: Don’t assume that your sales reps (or other team members attending the event) are up to date on lead capture technology. Although there will probably be some complaining, try to get your reps into a room to refresh them on the process or train them on new tech. If you are using an event lead management app, you can have your reps install it on their devices (or the company’s devices) ahead of time so they can get some real-life practice. You want your sales team to be on board with your process. If they are not, you maby be less successful than you could be. More often than not, trade show organizers will provide an email list of people who plan to attend an event. Put some thought into your plan for encouraging attendance at your booth and start building those relationships early. Gone are the days when attendees just show up and wander around. With more and more millennials attending trade shows, conferences, and other live marketing events, we find that attendees are doing more research ahead of time so that they know who they want to visit and can plan accordingly. Make it easy for them; properly distribute and advertise your location and booth number through marketing emails, social media, and 1:1 communication (like Lead Liaison’s Sales Enablement). And don’t forget to include past attendees in your communication (based on location). Marketing events can be costly, so it’s important to ensure you are getting the most out of it. Properly managing your leads is essential. 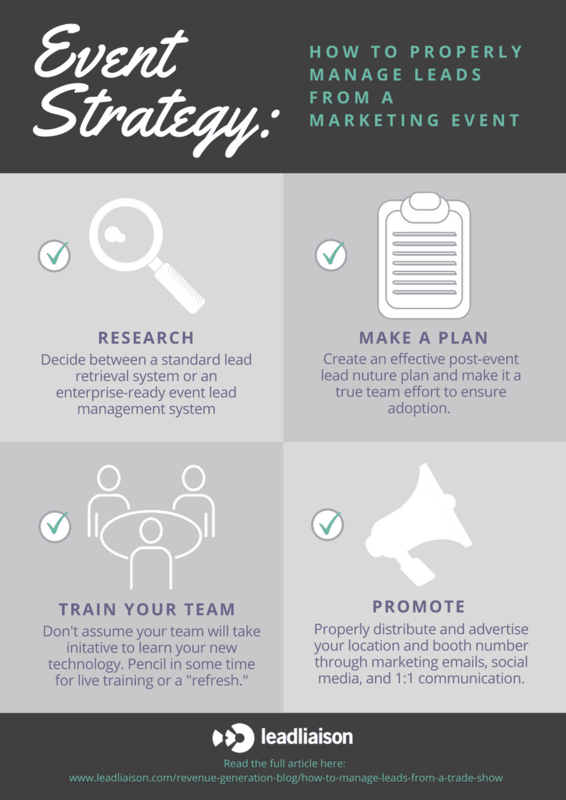 Include team members from both sales and marketing through as much of the process as you can, so that everyone is on board with (and will follow through with their part of) “the plan.” Below is a quick graphic you can print out and stick on your desk, so that you’re ready for trade show season! To watch this webinar in its entirety, click here. 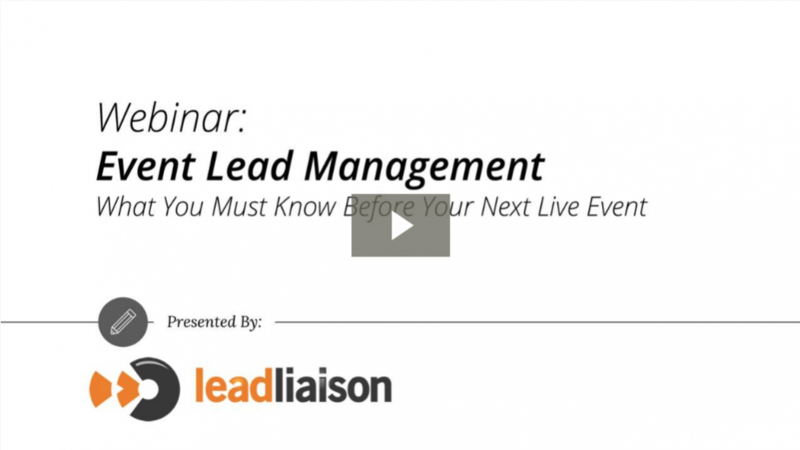 Learn how to make the most out of your next live event with proper event lead management. We’re talking about planning, lead capture, and post-event nurture. *Please note that this content was presented in first-person live and then transcribed. It will read exactly as presented in the webinar. Welcome message and company introductions have been removed. So we’re gonna go into a little bit of Event Lead Management and why it matters right now. Why we should be using this live events and why it’s very important that you have something on the backend to help you manage the events as well. And when we’re talking about live events we expect to have- if I’m gonna have people in two kind of major brackets right now: Business to Business and Business to Customer. B2B, B2C. A little bit of a different purpose for the live events but we’re basically doing the same thing at each one. This is about face to face interaction. It’s about generating excitement. So B2B- we’re gonna be working on some Prospecting. So we’re trying to find our influencers, maybe gatekeepers while we’re out there. We’re now working, we’re finding out who else is in our industry. We’re getting awareness of our brand out. In some extent we might actually also be talking to some existing accounts. This is a good time to do some relationship building with those existing accounts and of course generating more revenues – the end goal of all of this. For B2C, it’s a little bit of a faster sales cycle and B2C live events are actually really fun and really exciting. This is where you gonna have product demonstrations. We tend to have handouts for everyone. I always love getting the freedom of knickknacks [inaudible]. Customer interaction can be huge at these B2C events if they’re public events. But of course let’s not forget that we also have the possibility of vendor relations. So this could be an event where you’re going and you’re meeting with your vendors for your organization as well. And that can also apply to B2B a little bit there as well. Brand awareness is gonna be huge for B2C and again generating revenue. So these are a few different reasons why you might go to a live event. These are the areas where live events tend to be most effective compared to other types of marketing like emails or even physical media. So just a couple of things to be aware about live events. So first off let’s talk about Social Media a little bit. Social Media is one of the biggest ways that marketers are trying to spread brand awareness right now. Especially in that B2C field but also big end B2B. And based on some recent sales we actually found that 98% of attendees to a live event or a trade show generate some kind of social media content. A lot of those are photos. So if you do have a set up there, if you’re attending one of these live events and if you have something that catches their eye, there’s a good chance that that’s gonna end up on social media and that doesn’t hurt anyone. 72% of consumers say that they positively view a brand after a quality event. So if they go to an event, it was a great event and they thought yet a good presentation, they’re going to view you more positively. And in fact 84% that do make a purchase from you eventually are going to repurchase after that first purchase and that’s if they’ve attended a live event first. So we can’t really underestimate how important this is. For a lot of organizations, you get to lead and that’s where a great marketing could go home, they could give the sales team a lot of prospects but at the end of the day, recent studies have found that 85% of event leads are never followed up with which is crazy when you think about it which is crazy when you think about it. And if you don’t follow up with this leads they’re probably not gonna come back to you. In fact, especially in that B2B marketplace, it’s very rare that you have someone reaching out to you like, “Hey! I met you there I thought you’re gonna send me stuffs?” They’re probably just gonna move on to a competitor. So it’s huge that we have some way of managing what happens to this leads after the event is over. 22% of companies say that they have no way to track ROI from one of these events which again is very crazy. I’ve actually seen several of our clients where they’re throwing money into live events but they have no idea if they’re making anything back from it or not. And that’s one of the things that Event Lead Management or ELM can really help with. And finally, only 14% use event management software. Now it kinda depends on which bracket we’re in. About 22% of companies in B2C will use Event Management Software. But only 9% in B2B are using Event Management Software. And really that’s not a surprise. When you look at those top two numbers: the 85% not followed up on and the 22% of companies not being able to track ROI, well it comes down to this bottom number. There’s just not a lot of penetration out there. People are not taking advantage of the tools that are available. So we’re gonna show you how you might be able to use an Event Lead Management tool today and we’ll be showing off our platform a little bit in the ways we can help at. Hopefully, we’ll give you some good ideas for your next event on how you might want to handle it. So the Event Management Process- I’m gonna break that down into really three major areas. There’s the planning stage which happens before the event, the attending stage – that’s the event and following up which of course is what happens afterwards and that’s the really key important part. That’s gonna be where you make your sales. So talking about planning a little bit. The first thing we need to establish is a way of tracking ROI, a way of tracking our lead sources and getting our content organized together. So I’m gonna show you real quick an example of how Lead Liaison handles campaigns and a lot of ELM software. You’re gonna see something like this and you’ll see the importance of it. So I’m here in our platform and this is our campaign’s area – these are our marketing campaigns, and I created a campaign. I called it the 2018 Webinar Trade Show because I’m not ultra-creative. So here we are one of our webinar, we’re talking about trade shows, there we go. And with this campaign, I’m able to associate a cost to it and so this cost might initially be what we’re estimating the cost is gonna be once the event is over we know we’re gonna have expense report, we’re gonna have all the things. We can go back, we can edit this cost and adjust it as necessary to whatever the trade show ends up being or conference or whatever live event we’re talking about. The importance of this is any content I create like my webform that’s gonna be set up for our lead capture device, any automations I have ran that are doing nurture, all of those are gonna be associated with this campaign. And we’ll see at the end of the presentation, as people come in here, we’re gonna be tracking our cost per prospect, we’re getting opportunities from this or we’re getting wins from this or we’re gonna show you how we’re can convert this number into a full ROI and in addition to campaigns we also have a concept of what’s called programs so you know this campaign is in our trade show program. So each individual trade show or event is gonna have its own cost, its own people, its own content but the overall umbrella that is under trade show. So this is actual way of tracking how events or trade shows, in general, are doing for your company and that’s a really key part that people miss. You might have one or two events that are doing really well but then you have 10 others that really aren’t doing so well. So your overall program isn’t as efficient as it could be. And again that’s a big area that we wanna help you out with. So just to start out we wanna make sure that anything that we create is associated with the campaign and it’s in those campaigns are associated with the programs and that’s really gonna pay off later on we’ll see on the following up side of the presentation. Now in addition to planning and setting up our campaigns and programs, we also have to decide who to invite. I’ll tell you in this day and age it’s really not enough to just show up to a trade show. If you just show up there to a conference event trade show, and you’re just standing behind your booth, you got your nice pens that you’re gonna hand out to people and some physical brochures, you’re gonna be that really friendly person who’s standing in there smiling in the corner with no one in their table. So it’s important that you start generating some people to come and meet you at these events. So who are you gonna invite here? Some great sources that we’ve identified. If you have a newsletter, you know talking to your newsletter subscribers can be a great way of doing that. They’ve opted in so they’re interested in your company in some way. Anyone who’s a current opportunity. So if you’re in a middle of the sales process with someone, then go ahead and invite them out. This is a good time to see them face to face. And of course prospects that may not currently be opportunities, maybe you’re just in the initial stages of that sales pipeline, get them going too. Or maybe they’re even former prospects. We had someone where for one reason or another the deal didn’t close. I mean if we’re amicable with them? If we parted on friendly terms and we kinda understand why we lost that deal. Yeah let’s invite them out! You never know someday down the line but not a customer today, they could be a future customer. So it’s a great time to invite them out as well. And for the invitation process, we really do recommend going with a multi-channel approach. So what we see most of the time and industry-wide it’s about 63 to 70% of these invites are going to be done directly through email and that’s great! Email is easy to put together. You can reach a large number of people, but email isn’t always the most effective way of getting people’s attention. We do also have the ability to send things like postcards or handwritten letters. You can also take advantage of pay per click advertising and landing pages. And the idea is to start pulling people in from this different channels – social media is obviously another place where you’re really going to want to start inviting people to come in and that’s gonna really fall into the same category with the PPC and landing pages. You have your social media accounts, you’re getting them into the landing page to throw out ultimately the form. And this is actually similar to how this webinar setup was where we send out this invites to you. You went to a landing page, you filled out your information and that registered you for this webinar. It’s the same thing except with an RSVP form for an event. And this is a way of basing the communication around their interaction. If they’re already showing interest. If they’re already engaged, we don’t wanna bother anyone. But, otherwise, we can continue to try to get their attention and this is where we can also get more creative and do things like send a second postcard if they haven’t filled out the form instead of doing an email. So several ways of handling this. This is just a quick example though how you might have that set up. So back in here with the planning there’s a few other things that you gonna need to decide what data points you wanna capture. And this is where it’s really going to affect your sales team as well as any marketers or any representative that you’re gonna have on the floor. So this is where things get really important and we’re gonna go back into Lead Liaison here. I’m just gonna show you our form builder just so I can give you an example as we’re talking here. So I have a form that I’ve set up here and I’ve identified a few areas that I might wanna capture information so. I’ve left an area for my sales people to capture business card. I’ve given them a [inaudible] for their name, email, phone number, their company. Pretty standard contact fields. But I’ve also made some custom fields. So I have this one field called VIP. And this would be if we have a sales person who feels like this is a really qualified lead we really wanna to talk to them a lot. We have area of interest so we can decide “Hey are they looking at marketing sales, public relations and other…” Just an example from our Verticum. I even have a checkbox field here for Product of Interest. They can select multiple products if they need. And of course I’ve left an area for notes for them here. And I’ll show you just what this looks like on the front end. This is the actual trade show app. So this is what we would be running on your devices at the event. And let’s say I just look in here at this particular form, you can see that it’s been captured from here. So here’s my name fields, email, VIP etcetera. So this all transfers over. Another new thing with the Event Lead Management software, this shouldn’t be too much of a surprise if you’ve used those scanners at trade shows before, you know kinda how you can scan the barcode and move from there. What’s great about this is the customized ability. So I have those custom fields but I can also make changes on the fly. So you see an example here I’m just gonna go ahead and add an image field into this so maybe they just wanna be able to take a picture or save a picture from their device. I’ve saved that and I’m gonna go ahead and reload my form here in my device. My device says it syncing right now cause it already received that update. If I’m going to capture, you can see that we have that image element down there already at it. So we can add things in real time if needed. But I tell you what? The best way to handle this is to make sure you have the form ready to go before the event is there. And again, marketers sit down with your sales team. Find out what information they feel they need for a qualified lead. Sales – sit down with your marketers and find out what information do they need to be able to support you later on. So back at our presentation here. We’re gonna talk about actually attending now. So this is gonna be the part where we’re capturing the leads and there’s a few common ways of doing this that you’ll see at different events. One can just be a simple form submission. So I’ve seen companies with clip boards. You can actually use a device like we have for GoCapture that’s our form submission application. Barcode scanning is increasingly popular especially in the United States where you can just go up scan their barcode on their badge and you’re good to go and then Business Card Transcription is something that’s really taking off and transcription is really unique. And then say that being in the computer trying to guess what the appropriate field is there. I’m giving you about 70% of the way there an accuracy. Transcription is done by a live person. It’s guaranteed 100% accurate so you know you’re getting good data as it comes through. And of course, we also have the old-fashion way of passing business cards around. I’ll tell you without a system to really help you capture those leads and upload them immediately you’re gonna start losing things. So let’s look back at GoCapture real quick. Let’s look into are forms. So I’m here on the form screen of Lead Liaison. I’ve got GoCapture opened here. I might just give you an example where I could fill out this information and go through. Put in the name, the email. We’re gonna talk about this VIP field, in just a second. But if this is maybe a B2C event or an event I’m hosting, I might actually know who some of the attendees are already so I can also attach a list to this field as well and just select their name from a list. Doing that, the system will fill that in for me automatically, which is really great. Maybe I’ll say this person’s a VIP and they’re interested in the sales and they want site engage and Event Lead Management. We can leave some notes and then I just hit ‘Submit’. And that’s really all there is. That’s lead capture at its most basic. I’m gonna go in here. I’m gonna review that submission. If I need to, I can check the submission make edits. I could block it if this is with someone from another vendor. They’re trying to sell me something. I just wanna be polite. Taking their information, scanning their badge. I could block them and not upload it. But I want somebody to upload. I’ll just click this upload button and it immediately goes back to Lead Liaison. Infinitely, this can also be set to auto-uploads so the moment your representative hits that ‘submit’ button, it’s gonna go to our back end. And if I refresh the page here in our web app, you can see that that submission has already gone through. And this is where event capture tools are so important is you’re getting that information immediately. Nothing is getting lost out or falling between the cracks and what’s really important using a solution more like GoCapture is that its instant transmission. Unlike where you go to the shows, you have the scanner and you get a list later on at the end of the day. That’s not bad. But when we get it instantly like this, there’s a few other really cool tricks that we can do. Now before I move on to the nurture in the other piece, I’m gonna show you here. I do also want to mention barcode scanning. Because like I said before, that’s gonna be a huge way that people capture leads at these events right now. You can use an Event Management software solution like Lead Liaison’s Event Lead Management and you can still do your barcode. So with regards with the trade show tells you most of the time, you don’t have to use their scanners. They will have some kind of software developer kit that solutions like Lead Liaison are able to use. So I have some sample barcodes here and I’ve got an identical version of the form with the barcode reader. And you’ll notice one thing, I’ve put all of the contact info down at the bottom here and here’s really what the idea of this. I’m gonna move this over since it’s a little close to my phone here. I’m gonna choose to scan the barcode and the device will recognize it. What it’s gonna do is it’s gonna make a call back to the barcode provider and then you can see down here. It’s actually filled in that contact info for me. So if I’m at a really busy event, I don’t wanna have to stop and type everything. I can just scan that code. And I put this custom fields at the top, so I can just fill those in really quickly. And we’re done. I click ‘Submit’. And the submission’s through. I’ve moved on for my next person already. So if you want your representatives to love you, give them a shortcut like that where they can just scan a barcode and fill in those custom fields. Now where things get really important with event management is the nurture during the show. This is something that not a lot of places talk about. They talk about pre-show nurture and post-show nurture. We’re talking about nurture during the show. So this is another automation that I have setup here and this is something where we can just start getting people excited during the event. So my representative has used GoCapture. They’ve uploaded the form immediately. So I already have their data in the system just seconds after they captured it. What’s gonna happen with this automation, it triggers as soon as the prospect is submitted and I’m telling the system to wait five minutes and then just send a ‘thank you’ email. And this email will just say something like, ‘Hey! We really appreciated you coming by our table. It was wonderful to meet you. We were really excited to learn more about your company!” And again, we can use merge fields to actually insert the name of their company. And I have a condition down here, that if they are already VIP, we’re gonna use one of our Webhooks with Twilio to send out a text message and this text message will say something like, “Hey Jennifer! Thank you for coming by our booth! By the way, we are doing a cocktail tonight at 6 p.m. at the Marriott. Won’t you come and join us?” So I’m actually inviting them out there and recommending that they come back and see me. That’s because this person I feel like they are a VIP. I want to interact with them again as quickly as possible. And you can even go further than that. We’ve actually had a user use the text message feature to say things like, “Hey! are there other people from your company? Send them back our way and we’ll give you a special offer.” And what’s cool is if someone does text back since this is handled through Twilio. Twilio is able to forward that message back again. And again those text messages just like our postcards and emails use data merge fields so we can personalize these messages without having to do anything beforehand. So really great way to get people engaged in at events. This is the key is getting people jumping back in. So we’ve kinda gone through attending through this slides so I’m gonna go and skip over this side. The big thing afterwards is gonna come with the post event nurture. And so I’ve got one last automation here. And this is for our post event follow up. So this is somewhat similar to what we would recommend when you’re using your event software. So the first thing we’re doing, we might tell this to wait maybe a couple of days so after the event and then send another follow-up thank you email or hover when I handle that. If you’re using a CRM like salesforce.com or Microsoft Dynamics, you do wanna make sure that your events software is able to sync up to it. We do actually have a direct connection with both of those programs. We also do have ways of pushing leads into other CRMs like Pipelines or SOHO. We even have our own complementary CRM. But in this case, I’m using Salesforce as an example. So once the event is over I can tell the system to sync those leads that we capture directly into salesforce.com and really I don’t even have to wait I could be doing this at the same time so everything’s immediately in Salesforce. Once it’s in Salesforce, I can add it to a campaign. I can even create a task. So remember when I said earlier on only about 15% of those leads are ever being followed up on. 85% are being ignored. Well, we can use Salesforce, our CRM, to make sure we have a task to these people, are being followed up on. So this is a great way to make sure it’s in there. Another feature that I’ve mentioned before is are handwritten letters. So let’s talk about VIPs again. These are the people that we invited out to that cocktail party. Well, instead of just sending them the regular ‘thank you’ email and all the rest of it maybe I’m gonna send them a handwritten letter instead. Handwritten letters carry a lot of weight and a lot of value. So I can send them a handwritten letter. It’s personalized. And when I say handwritten, I don’t mean we’re gonna make you write a letter. We’re going to write a letter for you. So this our handwritten letter template here. You type in what you want the letters to say. [inaudible] right here there’s a merge field. So we’re going pull this from the prospect profile and what’s awesome is you can choose the pin color, the type of handwriting. So if you want female cursive or a male print, that’s not a problem. You can even add a drop in. So here’s an example of a five-dollar Starbucks gift card that we could drop in. I’ve seen some companies drop in some brochures. I’ve even seen a company that does a send along that we call down here. They were sending t-shirts out to people. So this is another really good way of re-engaging them with them once the show is over. And again you can handle this towards just your VIPs. So it’s only those most valuable people that you’re getting this letters to go to. If you wanna make them feel really especially that’s an awesome way to do it. And from there that’s where we gone through our sales process. We have our sales team taking over. What’s gonna be important from the more marketing side of things and the sales management side is okay that’s great that we had all that but where is our ROI. How much money are we making from this? So I mentioned before that you can put all of these things into a campaign. Well once inside a campaign, we’re gonna start tracking anyone who comes in. So let’s say that we have our form. The form is a part of the campaign. So anyone who comes in, submitted from that form is automatically added to the campaign. So the first thing we’re gonna do is we’re gonna tell you how many people have actually come in from that and prospects. Prospect- the idea of these two columns. Prospect means we have an email. People means we don’t have an email. But we’ll tell you who’s come in as a result of that campaign and from that we can get you the cost per prospect. Pretty simple so far. But again if you are using a CRM like Salesforce.com or Microsoft Dynamics, we’re gonna continue to monitor those prospects once they’re in there and hopefully you’ll eventually convert that lead into a contact and attach it to an opportunity. And so then we can tell you how many opportunities were created as a result of this trade show and the cost per opportunity plus the value of your opportunities. And then of those opportunities we’ll tell you how many of them are one and how many revenue dollars have come in which then gives us our total ROI for everything coming in from that campaign. And this is huge because the system is doing everything for you automatically. You just let it do its thing. The only thing you have to do is just set it up beforehand and then let your representatives capture the leads, everything else is happening automatically. And that’s the beautiful thing about having event lead management combined with lead management automation or marketing automation. And like the campaigns, we also track the ROI on the programs for theirs so again I had a trade show as the program. So it would tell you the same data points of how many people have come in as result of that program. How many opportunities? How many wins? And then the same thing for lead source too. So if you wanted to put in trade shows as a lead source, you can get an idea of how effective those sources are in comparison to your other sources. So you might go into your lead source report and realize, “Hey! I actually closed a lot of deals from people who come in from pay-per-click advertising and from social media and I actually don’t get that much revenue from events, so maybe I can start closing out a couple of events.” Or maybe you go in and you realize, “Oh wow a huge amount of my revenue is coming from these events. Let’s really ramp it up!” And you’re not gonna know that unless you’re actually going in there and your tracking the ROI. Now if these all sounds like a lot to set up and it all sounds a little overwhelming, don’t worry! If you do have a solution like Lead Liaison as I mentioned before you do have the Integration Specialist like me. I would be helping you set this kinds of things up and especially through your through your first few months worth of shows. We’re gonna be there with you. We’re gonna be making sure that everything is working correctly. So it’s a great tool in general and again, if you’re not using events yet, hopefully you can kinda see by now there’s a lot of value to go into the events. And it’s not that complicated. There’s nothing too crazy about it. As long as you have the right preparations, you can handle the event and you can run them and you can get ROI on them. So if you do have any questions about that, we’d love to hear it. Now I believe that we do actually have a couple of offers going on today. So I’m gonna hand it back to Jen so she’d be able to talk about for you and then we’ll take some questions. Jen: Thank you Chris. Yes, absolutely. So I’m going to take over the presentation as well and get you guys over to our special offers here. So our first special offer is if you would like to purchase our stand-alone solutions and as Chris mentioned GoCapture several times at our Events Lead Management solution. That’s powered by GoCapture. If you want to purchase a stand-alone solution, it’s two free months off of your subscription. If you currently have a Lead Liaison license and you wanna add this to your Lead Liaison license, we’re offering one free hour of training, which the training can get fairly pricey. So that’s an amazing offer there. So let us know if you guys are interested in those. Just mention the webinar and we’re happy to assist there. Now so I’ll go into the questions. Everybody, you should see the question area on your Gotowebinar screen to just so you can type your questions in there and I’ll go through and kind of asked those. We’ve got a couple here and that I’ve seen come in. So the first one is can you highlight some information about the users and the amount of devices that you can have? Is there a limit to that? Chris: Yeah. That’s actually a really good question. So it kinda depends on the solution you’ll go with. A lot of solutions are going to limit you like 3 or 4 devices and then you’ll pay like an extra 50 or 60 bucks a month per user. I’ve seen up to 200 per month per user. Our Event Lead Management solutions a little different in that we don’t have any limits on the number of users. So it’s a flat rate and if you have 50 different reps, send out 50 different invitations. Jen: Awesome! Thank you. Alright, we have another question and which lead capture method do you recommend in those or do you see used the most? Chris: If we’re in the US, the one I see used the most is definitely going to be barcode scanning. That’s just something that became very prevalent in the event industry in the last 10 years or so. And the event industry has been just growing like crazy. So that’s the one that I see commonly used the most. The best thing about it, is like I showed in the demonstration is you can just do the barcode scans so it’s filling in all the important information for you. And then you just fill in your custom fields for your particular organization. Hit submit and then you’re done. A single submission takes less than 10 seconds. You can just go through one after another. Next I would probably say the next most common would be the business card transcription. We have a lot of companies where they’ll just say, “Hey go out there and take a picture of the business cards, then they hand the business card back to us. We transcribe them and do the rest.” But most used in the US, that’s gonna be barcode scans. In Europe, we tend to see more business card transcriptions. Jen: Wonderful! Thank you Chris. Alright, let’s see one other question here. What information can be included or captured on the form? Chris: Yeah so, the information that you can capture is pretty limitless. So you can create any number of custom fields for our forms. So you saw that I had some fields in there for VIP or for product of interest. Those were all fully-customized forms. I created those fields myself. Put in the possible responses. If you’re currently leaves on client, it’s almost identical to our web form builder. For some who’s new with Lead Liaison, it’s a simple drag and drop builder. Generally for me it takes less than 3 minutes to put a form together even with custom information. The custom fields you can have is a single line of text, a paragraph of text, a drop-down menu, checkboxes which is your multi-select field and then a radio button which is kind of a true or false multi-select with only one answer kind of thing. Jen: What is an absolute no-go when in contact with leads at events? Chris: A no-go. Well, one thing like in all cases when it comes to marketing and I’m assuming with that no-go, you’re talking about what are some things that you’re just not supposed to do. One if you do have an automation setup on the background, if they haven’t opted in to email, you don’t wanna start putting them on to Marketing lists. It’s generally fine to send a thank you email or something like that because that’s considered transactional. But you do wanna be careful putting them on some marketing lists. Beyond that I mean be general trade show etiquette. But if you kinda meant something different with that no-go, just let me know and we’ll circle back to this question. But really there’s not much that I would say that you just can’t do with a lead from an event especially since you’re face-to-face with them. You can talk with them. You can build those expectations. Email marketing is the only area I really say to still be careful on. Depending on your country, text messages, as well. So yeah. But if you need to clarify that more, we’ll go in a different direction with that. Let me know. Jen: You said that this is also available as a standalone solution. How does that work if I do not have Salesforce? Chris: Yeah so the Salesforce connection that we showed there, that’s an add-on that you can do. We have that because a lot of our partners out there, they use CRM like Salesforce or like Microsoft Dynamics. We actually have our own CRM that you can use as well. So if you’re also wanting to save the organization level and whether there’s deals or opportunities, we actually have our own CRM that you can actually add it for free to event lead management so it’s another just add-on. If you don’t already have the CRM, then we’re happy to provide that for you. And really, we can also work without a CRM altogether cause we’re still gonna store the prospect records for you. We’re still gonna store all the submissions but if you’re in a little bit better in organization and you don’t have anything else or if you’ve been looking to make a change on your CRM, that free option is actually a really nice CRM with everything you’re getting. So it’s stand-alone. If you have Salesforce, we’ll integrate with Salesforce. It’s a very deep integration. If you have Dynamics will do that and if not we can work with you as well. Jen: Alright! Thank you very much! I believe that wraps up our questions here. Thanks everybody for those. So that is the end of our presentation. Everybody keep an eye on your inbox, I will send in the recording like I said from the next week and there will be a survey that pops up after we close the webinar. So we’d greatly appreciate your insights on that. In that way it can help shape future webinars as well. So thanks everybody for joining today. I appreciate your time. Hope you learned a lot. Let us know if you have any additional questions afterwards and have a great rest to your day. Dallas, TX – This week, Lead Liaison announces a new event lead management solution powered by their event lead capture app, GoCapture!™. Previously, GoCapture!™ was only available as an add-on to the company’s robust marketing automation platform, Lead Management Automation (LMA)™. Now, the solution stands on its own, providing businesses with everything needed to manage leads before, during, and after any trade show or other marketing event. It also seamlessly integrates with their free CRM, called OneFocus™, and marketing automation platform, or any third-party CRM or automation supplier. GoCapture!™ allows users to customize forms, quickly capture pre-qualified leads onsite, and then immediately segment, tag, follow up, and nurture those leads without missing a beat. What makes Lead Liaison’s solution particularly unique, is that they do not restrict usage across all users, mobile devices, back office users and events. No other lead capture app in the market does this. The sales and marketing solution provider wanted to offer this as a standalone solution because the company had the chance to offer a very unique business model. Today, there is nothing in the market that has the flexible license structure and unlimited usage options that Lead Liaison offers. Even companies that offer similar solutions have very restrictive business models when it comes to number of users, devices, and events. Information can be collected by scanning a badge, scanning a business card for transcription, auto-populating from a list, or having the lead fill out a form at a kiosk. The app works on iOS and Android smartphones and tablets. Lead Liaison’s event lead management solution also hosts a powerful “back office,” through which the leads can be imported, synced, segmented, tagged with appropriate event information, enriched with social data, and placed into a nurture campaign. To learn more about event lead management as a business strategy, visit https://www.leadliaison.com/event-lead-management-strategy/. Your organization just attended a big marketing event. There was a lot of planning that went into your organzation’s participation at this event. You spent lots of marketing dollars trying to make an impact, and hopefully creating a lot of leads. And it worked! Your onsite representatives collected tons of leads! You probably already know that your event follow-up is important, but did you know just how important it really is? And, how rare it is?! Why is the timing of your event follow-up important? According to recent research from Certain published on MarketingProfs, “some 73.5% of respondents say their firm takes four days or longer to follow up with event leads. Just 2% of respondents say their firm follows up with event leads on the same day.” Most respondants to this research said that the reason they do not follow up quickly is because of how long it takes to prepare the outreach and that they do not have the tools to speed up the process. Prompt event follow-up is critical. It allows your organization to stand out from the competition because it shows that you care enough to make that follow-up a priority. Event lead capture methods, like our app GoCapture!™, are an important part of any marketing automation platform. This functionality allows companies to streamline thier event follow-up in a way that is personal, instantaneous, and repeatable. Our app allows onsite representatives to collect lead information quickly (without losing any valuable information), by scanning a badge, a business card, by manual entry, or even syncing with a registration list. Then, once that information is captured, it can be automatically uploaded to our database, segmented, and placed into a nuture campaign. That nurture campaign can contain releveant event follow-up information in the form of email, text message, postcard, or even a handwritten letter (our personal favorite!). Whatever the method of outreach, the message should be well thought-out. What kind of message to you send in your event follow-up? First and foremost, your event follow-up should identify the specific show by name, within the first paragraph or even in the subject line. This immediately validates your outreach, which should encourage recipients to read further. And, don’t forget to include the information from the onsite representative that the prospect came into contact with. That will help create a personal connection with your outreach. The conversations that onsite representatives have with leads can be breif, or very surface level. Your event follow-up messaging should offer a range of options for further engagement – also known as your call-to-actions (CTAs). You really want to appeal to a range of prospects at various stages of the selling cycle. You could offer a free download of a high-performing white paper, offer a free demonstration, or simply encourage your prospect to sign up for your company newsletter. These clickthrough options will help sales prioritze which leads should be called first and will also allow for further segmentation. If you are interested in a better way to manage your event lead capture and your event follow-up, let us help you! Check out our event lead capture app, GoCapture!™ and our marketing automation platform, Lead Management Automation (LMA)™. If you like what you see, don’t hesitate to ask for a free, personalized demonstration.